This little herb and annual garden layout is a variation on the traditional knot garden. It's not as complex to put together and doesn't have many twists but with multicolored basils, annual flower displays, and as a focal point a potted plant in the middle this garden can be put together easily and very inexpensively! This plan consists of 20 purple leaved basil plants ('Purple Ruffles' or 'Dark Opal'), 14 green basil plants (Italian basil will work but 'Spicy Globe' basil has a nice form that would be perfect), annuals (zinnias and marigolds are moth easy to grow from seed), and a potted plant in the center. 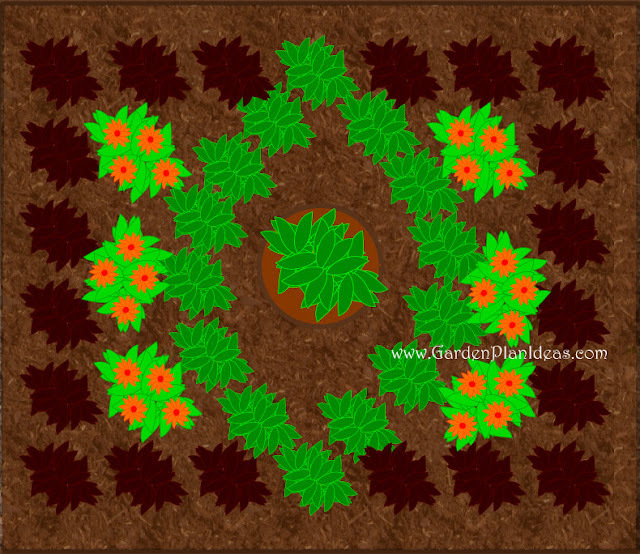 Alternately you could put more herbs, a birdbath, flowers, or even vegetables in the center. All the annuals and basil can be grown from seed very cheaply or you can buy a couple basil plants of each kind and propagate the rest of the basil through cuttings.